Place Tours in Kuala Lumpur Malaysia -Kota one is very popular as one of the tourist destinations in Southeast Asia. Kuala Lumpur which is also the State Capital of Malaysia, so a tourist gateway in Malaysia. No wonder if Kuala Lumpur is also a tourist city that has a fairly rapid development in the field of tourism and supporting. Going to KL City, the fastest step is definitely by using aircraft from various cities in Indonesia. Currently, there are many direct flights to and from KL such as Jakarta, Denpasar, Bandung, Surabaya, Makassar, Palembang, Medan, and other major cities. Ticket prices are also various and generally quite a lot of promos obtained from some airlines. Another alternative is to use the sea route from Batam. Yes, from Batam Island, you can use the Ferry from the International Port of Batam Center with the intention of Situlang Laut Port in Johor Bahru by the time of the voyage about 1, 5 hours. Keep in mind that this fery only exist until at 5 pm only. From Johor Bahru, then the journey continues with travel Bus to KL with the time travel around 5 hours. If you use the airway, so you will arrive at KLIA (Kuala Lumpur International Airport). The ultimate best goal when arriving in KL is to KL Sentral soon. Why? Because there are all types of public transportation to all corners of the city there. To get to KL Sentral from KLIA, you can use the Airport Coach Bus (Damri's kind) which is counter to Ground Floor Block C KLIA. The ticket price itself is RM 10. Another alternative if you want faster is by using KLIA Express Train. The tariff is RM 35 which operates from 5 am to midnight. In KL central there are also various means such as eating places, some shops, up to lockers to put your luggage if you can not check in the hotel. Its price also varies from RM 5 for small locker size to RM 20 for the large size. For those of you who want to find lodging, KL Sentral location is also quite a lot of hotels/hostels with a variety of price options. In Kuala Lumpur, if you are so careful about the cost, choose public transportation such as KTM Komuter, Monorail, LRT train, Bus Rapid KL, or Public Bus. Even if you want to use a taxi, better buy a ticket on the official counter like when in central KL there is a counter at ground level. This sort of thing is definitely safer and cheaper, in other words, do not be cheated by taxi drivers. Beyond that, tourists will be spoiled by the presence of a free transport bus called Go KL. This bus for free will take passengers to most major tourist destinations. There are currently two paths passed through the green route and the purple route. The Green Route includes trips to Petronas (KLCC) locations to Bukit Bintang. The purple route includes Central Market Street to Bukit Bintang. For tourists who want to change the route by changing the mode of transportation such as switching to monorail or LRT, then it can come down in some stops such as Buki Bintang, Central Market, KLCC, and Ampang Park. Already know how to get to Kuala Lumpur Malaysia. Na, then make sure you know any tourist attractions in Malaysia so it is not confused to choose where the footstep. Here we present the most famous tourist attractions in Kuala Lumpur Malaysia that you must visit at least once in a lifetime! Mosque built in the. 1965 is in his daily never empty of visitors. When you tour here is likely going to meet foreign tourists, especially from the Arab countries who are cool to take pictures or even make a movie with the background of this State Mosque building. The place is quite strategic because there is in the city center and adjacent to the Railway Land of Melayu (KTM) and not far from the Tugu Negara and Taman Tasik Perdana make a visit to this mosque could be the main agenda before visiting another is no less cool and fun. And one interesting thing from this mosque is the words "Beware Thieves Shoe" or "Beware Thief Shoes". Why interesting? In fact, the neighbor country has the same problem with Indonesia related to the security and comfort of pilgrims inside the mosque. However, it certainly should not be your obstacle to be able to visit the State Mosque as one of the pride of the Malaysian Jiran. Guide For you who will come here recommended to wear polite clothes and take off shoes/sandals when entering space in the mosque. Transportation To arrive at the State Mosque you can use the Putra LRT Train which will stop at Pasar Seni Station. From there you can walk through the distance is quite far but consider it as the previous warming in awe of the architectural beauty of the mosque building. Place When you are in Kuala Lumpur Malaysia and want to see the beauty and architectural elegance of the Mosque Tower (National Mosque) is so can come to Jalan Perdana 50480, Kuala Lumpur, Malaysia. Welcome! Alor Street can be said as a legendary hunting place for culinary locals or foreign tourists alike. Here you will find a more vibrant situation in the afternoon until the evening before because crowded with many people want to enjoy the situation and culinary offerings are here. Therefore you should never miss participating in the liveliness of the situation and the comfort of dining. The most interesting thing from Jalan Alor Bukit Bintang is a food stall or restaurant that is on the left and right of the road so you and other visitors will feel there is a culinary paradise. Also when you dine here will feel the sensation of eating is not the same because the seat is in the open air until you can eat while looking at some of the people huddled. Some of the menu you should try while visiting here include spicy crab crab, five spice crab, black pepper crab, Hongkong crab, seen Chuan crab, chili crab, seafood crab sauce, bak kut the, laksa, satay, grilled fish, fried noodles , grilled chicken wings, and various delicious and delicious fried rice. All types of foods that you can taste freely without having to hollow bag because its price is quite cheap. You will be amazed at this location because you can see a variety of architectural marvels are dominated by Islamic nuances so prominent and charming. Putrajaya Lake and Putra Mosque are in Prime Minister 62502, Putrajaya, Kuala Lumpur, Malaysia. With all the charms and offers of such beauty, it is not surprising that Putrajaya is thus favored to be visited. Some places that are worthy and visited by many tourists groups in Putrajaya is Putrajaya Bridge (Putrajaya Bridge), Putrajaya Lake, Putrajaya Mosque, Putra Putra and others. 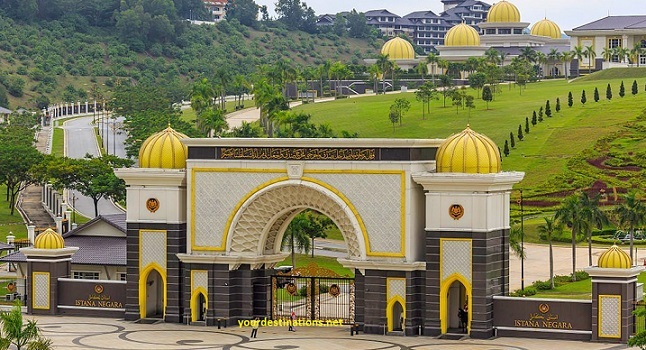 So is the buildings in the palace complex that is not less captivating when it became one of the tourist destinations while in the middle of this Putrajaya location. One of the popular mosques in this location is Putrajaya Mosque. The location of Putrajaya Mosque itself meets with Putrajaya Lake and government office of Prime Minister of Malaysia, Perdana Putra. The mosque itself is named Putra Masjid taken from the name of the first Prime Minister of Malaysia, Tunku Abdul Rahman Putra Al-Haj. The Putra Mosque is one of the most important parts of modernity and the urban sprawl of Putrajaya. If you look inside the gate is more or less emblazoned with ornament in the form of geometry as a characteristic of Islamic architecture and the art of calligraphy is thick and beautiful. To enjoy the beauty as well as the scenery of both: Putrajaya Lake and Putra Mosque so you should take time to come to this Putrajaya! In Kuala Lumpur, a variety of shopping centers from the traditional, semi-modern to the most sophisticated can be visited to shop as much. A variety of local and international brand goods can all be obtained at shopping centers in KL. You are interested? And one of the most comprehensive and grandest shopping spots is the Kuala Lumpur City Center (KLCC) in the center of the Malaysian capital. KLCC is under the Petronas twin towers are a lot of inviting clicking admiring will anyone who set foot in KL. This KLCC can be reached by subway that will dazzle you-especially people who have never been on an underground train first. There are several orchestras shows to look at. Petronas Gallery The Petronas Gallery is a kind of residence for a group of local or international artists interested in publicizing his various works. You who like the art world so it is advisable to visit this Petronas Gallery. From KLCC Park visitors who hobby photography can capture some memorable moments that occur in an area (many are photographing the KL building at night). Places For those of you who are so interested to visit and shop at Kuala Lumpur City Center (KLCC) it can record the complete address on Jalan Ampang 50088, Kuala Lumpur, Malaysia. Phone: 03-23822828 Congratulations! This unique location is in Selangor which is approximately 13 km from Kuala Lumpur. Batu Caves is popular as the center of Hindu worship in Malaysia. As a tourist attraction in Batu Caves, this is the existence of temples in the cave to give an artistic impression in it. Not only that, there is also a statue of the god Murugan supposedly said to be the highest statue in the world. Wooow ... cool! Batu Caves also often be the spotlight because of every year, exactly on the bln. February held the Thaipusam Festival which attracted a lot of citizens attended. When the festival performance is generally the situation and feel in Batu Caves will be so crowded by the sea of humanity is extraordinary a lot. Like the celebration of Eid al-Fitr in the religious customs of Islam, this Thaipusam Festival seems to be one of the most important events for all Hindus. To reach to the main temple, each visitor is required to climb a number of 272 stairs so that for those who do not have a habit and do not have a fit body condition is not likely in other words tired. When you have arrived at the temple, you will generally be greeted by the hospitality of the pastor as a guardian of the temple. To go to Batu Braves this, the easiest is to use a taxi because the distance is quite close, 13 km in Kuala Lumpur City Center. It costs itself between RM10-RM15 only. If you are from the location of China Town Petaling Street then can take Bus Nr 70 and 349. While when riding the train you can ride KTM Commuter from KL Sentral to Sentul Station. Are you ready to climb? Come up in Batu Caves with its 272 steps! The location of Bukit Bintang is an entertainment center and shopping center in Kuala Lumpur that is so popular with local people. At this location, you will find everything like hotels, cafes, shopping centers, nightclubs, some shops, malls and others. The presence of some of these self-indulgent entertainment spots is an advantage that makes it so attractive to the interests of diverse groups. The bustling atmosphere and the bustling nightlife of Bukit Bintang have never been left behind by some hobby struggling with the night world. Some of the shopping centers you can visit in this popular Bukit Bintang location include Berjaya Times Square, Imbi Plaza, Bukit Bintang Plaza, Kuala Lumpur Plaza, Starhill Gallery, Low Yat Plaza, Lot 10, Wang Plaza River, and the recently opened KL Pavilion. Berjaya Times Square is one of the most complete shopping centers in Kuala Lumpur which also provides hotels and restaurants. The place itself is not located in Bukit Bintang but is located on Jalan Imbi where its close to Bukit Bintang is so easy to reach. Bukit Bintang Plaza, Lot 10 and Sungai Wang Plaza are shopping malls which are both close together and therefore easy to reach each other. Sultan Abdul Samad Building is Full Score History in Kuala Lumpur. Often many buildings or buildings that are so old-can reach several hundredths. ever-but it is still preserved. The historic building is set to close to the Merdeka Square (Merdeka Square). Do you know what is the Merdeka Square? This location is seen as a historic place for the Malaysian nation because for the first time its national flag was flown to this place as the last longest of its independence was obtained on August 31, 1957. After that, almost every year this square is a place to commemorate the events of Malaysia's independence day. The building has parts that are generally much admired by the coming tourist groups. The dome is made of shiny copper with an altitude of 41,2 m. This building is built by using red bricks to have a robustness that is so tested. The building has several arches that are so enchanting to look like curves of the ogee, multifunctional arches, horse-drawn arches, pointed arches and others. The Sultan Abdul Samad Building also has at least 3 towers, the Tower Tower as its tallest tower and 2 other towers that act as a lower altitude than the first tower. How can you be efficient to get here? There are several steps that can be used to reach to this place one of them by using the LRT Son Railway and stop at Jamek Mosque Station. Do you know the Masjid Jamek where? Then from Jamek Mosque Station to Merdeka Square (Merdeka Square) -if you do not understand you can ask the people around. A walk on foot takes about 15 minutes from the Putra LRT station of Masjid Jamek. This museum is so important historical documentation relating to the past that has ever faced by Malaysia. Throughout the Japanese occupation, this building was once used for the communications department building. As well as when it is within the power of the Malaysian government, this building is more treated and used as it should. National History Museum or National History Museum is the 2nd national museum in Malaysia after the National Museum. this museum is located opposite the Merdeka Square of Kuala Lumpur which is quite popular among some travelers. In November 2007 the museum was closed and its collections were moved to the National Museum. The museum building has its long history. The building of this museum is a building that includes old and age has reached several hundredths. Really superior! Early on, the building of this museum is made of wood and bricks with so simple. Based on some historical records, this building has been around since the. 1888 ago and then used as offices of Chartered Bank India, Australia, and China which became the first commercial bank operating in Kuala Lumpur. The bank is currently known as The Chartered Bank of Malaysia (founded in 1969 ago). Anyway, when visiting Kuala Lumpur you should take the time to visit the KL National History Museum to know more in questioning the history of Malaysia. Like other palace buildings, Royal Palace Malaysia is also a place that is so important to hold a variety of royal events such as the coronation of state officials, royal promises/oaths, and others. Then with the passage of time, where Malaysia is increasingly visited by some foreign guests "force" this royal palace to become a banquet or signing a diplomatic pledge with the countries of close friends. Royal Palace building is so majestic and has a beautiful architectural design is increasingly equipped with several rooms that are of which are functional. Room or space inside there has the benefit sense. Inside this Royal Palace room, there is one big room which in fact is a banquet place for honorary guests or official royal invitation. The first floor of this palace building is often referred to as the Facing Council, which is the ultimate place for the Honorable Majesty at the time of receiving royal guests from both the diplomats and some high-ranking state officials. Not only that, there are also some other places like Biik Duta, Minister Room, Queen Room as well as others. For your own transportation, from Kuala Lumpur, you can take a taxi immediately to the KL State Palace because some people are recommending it with the means of transportation. Congratulations!